So the soldiers, their commanding officer, and the Temple guards arrested Jesus and tied him up. First they took him to Annas, since he was the father-in-law of Caiaphas, the high priest at that time. 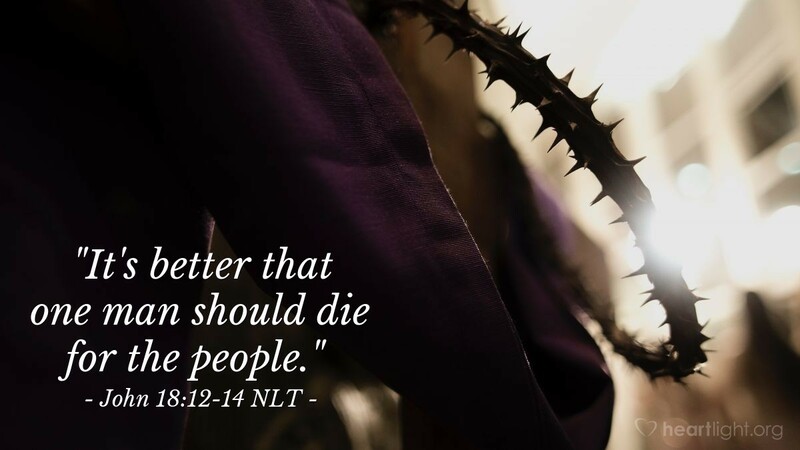 Caiaphas was the one who had told the other Jewish leaders, "It's better that one man should die for the people." Who really was in charge of what happened here? Yes, Jesus would be put to death at the request of the Jewish religious hierarchy and by the Roman executioners authorized by Pontius Pilate. But who was in charge here? Jesus was bound, but the executioners could not have restrained him unless he submitted to them. His obedience to the will of the Father was all that kept him bound. Meanwhile, soldiers, Temple guards, leaders, priests, and others who appeared to have been in power were really powerless to defeat Jesus. Jesus laid down his life according to the Father's plan and will. Jesus laid down his life to be the atoning sacrifice for our sins and for the sins of the world. Jesus laid down his life, or they could not have crucified him. Everything was reversed. Jesus was bound, but free to obey the will of God. The leaders were free, but their hatred constrained them to follow the plan of God. The events of the cross are the great reminder that God can use the worst of situations to bring about the greatest of results to his glory. Almighty God, please give me the courage to live for you no matter the cost. Help me trust that your reward and your power make the sufferings and struggles of this life pale in comparison to the glory that awaits me. Thank you for your Son, who pioneered this trail to glory before me. May my life reflect his faith in you and may it not waver even in the face of threat, suffering, or pain. In Jesus' name, I pray. Amen.